Despite record snow here in the northeast, my husband and I headed to Utah for a planned ski trip. We arrived to bare slopes or trails deep in slush. Enough of that. We headed south to three of Utah's national parks: Arches, Canyonlands and Capitol Reef. We felt lucky to get reservations at Moab Under Canvas, wonderful tented lodging with deluxe tents, safari tents and teepees. The challenge at any National Park is either to shoot the iconic photo in an unexpected way or to shoot another pretty postcard. In an effort to add a small twist to Delicate Arch, we hiked the couple of miles to the site in the complete darkness of early morning, the way lit only with our headlamps. Yes, we got lost but managed to arrivie at the Arch just before sunrise. Wow! I was completely unprepared for the emotion that washed over me when I rounded the cliff and saw the arch for the first time. Arches National Park "Delicate Arch" Sunrise with the sun glowing off the far red rocks beneath the snow capped La Sal mountains. Our last day was spent hiking at Capitol Reef National Park. Capitol Reef does not seem to get the accolades of other parks, but it's deep canyons striated with strong colors are inspiring. Spring color contrasts with the intricately patterned cliffs which surround deep canyons and vast vistas in Canyonlands National Park..
A rare birthing scene. Notice feet first presentation. Figures depicting bear paws, a horse and human figure date from the Formative Period. Newspaper Rock - Canyonlands National Park. 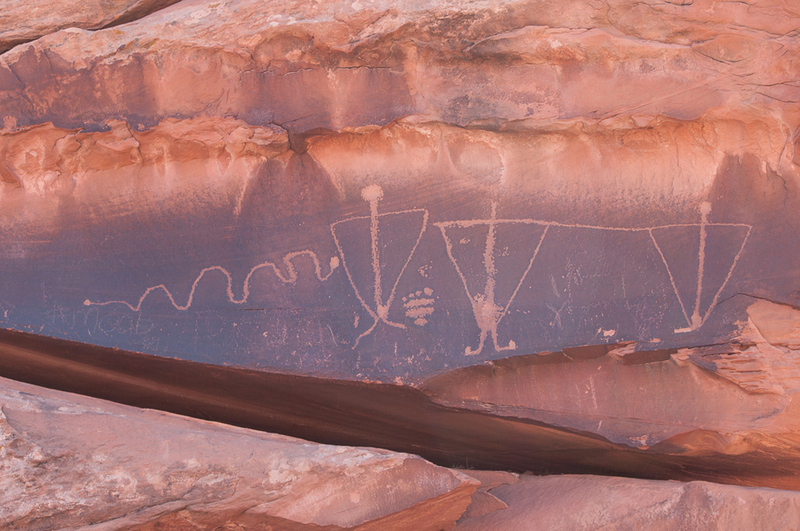 In Navajo called "Tse Hane" (Rock that tells a story). Newspaper Rock art is likely from several periods. The rock is listed on the National Register of Historic Places. 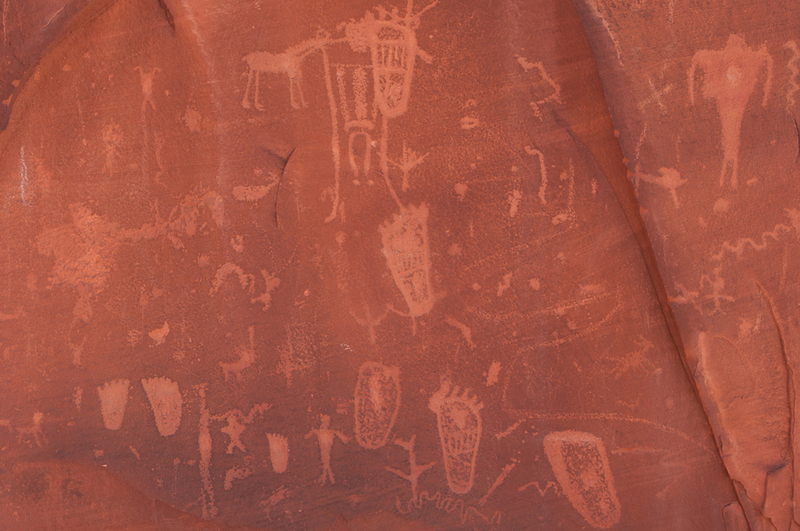 Fremont culture Indian art at Capitol Reef National Park. Petroglyph from the Formative Period (AD 1 - AD 1250) showing a bear with a hunter's spear at its nose.